Step 1 Dough In a bowl, mix the coconut flour, salt and psyllium husk powder together. Add the softened butter and blend together. Add the beaten eggs and stir the mixture thoroughly until combined. Pour in the boiling water and stir until a dough consistency is formed. Set aside to cool until the dough can be handled. Step 2 Filling Heat the oil in a frying pan on a medium heat and add the onion. Cook for 5-7 minutes until the onion is soft and golden. Add the spinach, lemon juice, rind, sumac, Feta cheese and black pepper and stir until thoroughly combined. Set aside to slightly cool. Step 3 Preheat the oven to 180C/350F degrees. Step 5 Remove the pastry circle and spoon about 1 tablespoon of the spinach Feta mixture onto the circle, slightly over of the middle. Pinch 2 ends first and then the third to form a pyramid. Step 6 Place the spinach feta triangles on a parchment paper lined baking tray and bake for 25 minutes until firm and slightly golden. Step 7 Put the spinach feta triangles under a hot grill for 3 to 5 minutes to give them a golden brown finish. Eat and enjoy! 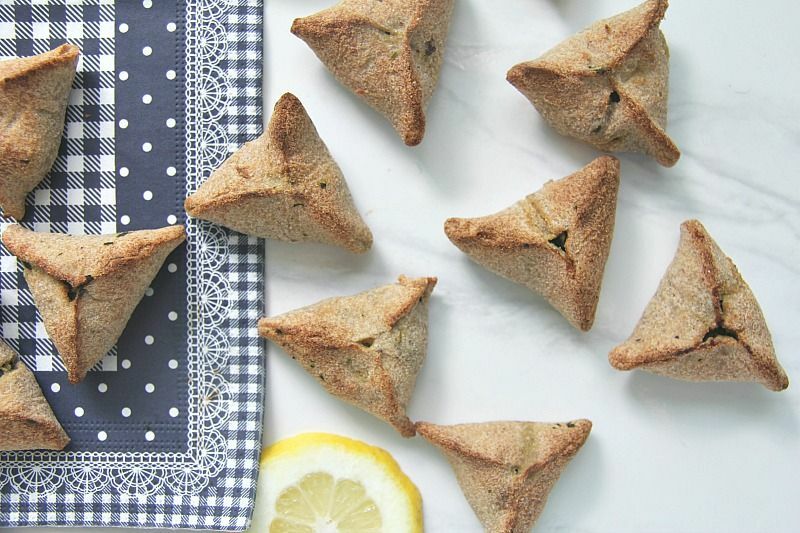 These spinach feta triangles are made with a low carb pastry and filled with a delicious mixture of spinach, feta and seasoned with lemon and sumac. Psyllium husk powder gives this pastry an elasticity and flexibility that is needed in a low carb and gluten free pastry. I often have a craving for a salty snack and this sounds like just the one I need. Don’t know if I’ll use feta, maybe cottage cheese..?